One of the first words that I learned when I joined the Media Lab was “antidisciplinary.” It was listed an a requirement in an ad seeking applicants for a new faculty position. Interdisciplinary work is when people from different disciplines work together. An antidisciplinary project isn’t a sum of a bunch of disciplines but something entirely new – the word defies easy definition. But what it means to me is someone or something that doesn’t fit within traditional academic discipline­­­-a field of study with its own particular words, frameworks, and methods. Most academics are judged by how many times they have published in prestigious, peer-reviewed journals. Peer review usually consists of the influential members of your field reviewing your work and deciding whether it is important and unique. This architecture often leads to a dynamic where researchers focus more on impressing a small number of experts in their own field than on taking the high risk of an unconventional approach. This dynamic reinforces the cliché of academics-learning more and more about less and less. It causes a hyper-specialization where people in different areas have a very difficult time collaborating-or even communicating-with people in different fields. For me, antidisciplinary research is akin to mathematician Stanislaw Ulam’s famous observation that the study of non-linear physics is like the study of “non-elephant animals.” Antidisciplinary is all about the non-elephant animals. The Media Lab focuses on “uniqueness, impact and magic.” What our students and faculty do should be unique. We shouldn’t be doing something that someone else is doing. If someone else starts doing it, we should stop. Everything we do should have impact. Lastly, things should induce us to be passionate and should go beyond incremental thinking. “Magic” means that we take on projects that inspire us. In the Lifelong Kindergarten group, researchers often describe the “Four Ps of Creative Learning” as Projects, Peers, Passion and Play. Play is extremely important for creative learning. There is a great deal of research showing that rewards and pressure can motivate people to “produce,” but creative learning and thinking requires the “space” that play creates. Pressure and rewards can often diminish that space, and thus, squash creative thinking. The kind of scholars we are looking for at the Media Lab are people who don’t fit in any existing discipline either because they are between–or simply beyond–disciplines. I often say that if you can do what you want to do in any other lab or department, you should go do it there. Only come to the Media Lab if there is nowhere else where you could do what you want to do. We are the home of the misfits-the antidisciplinarians. When I think about the “space” that we’ve created, I like to think about a huge piece of paper that represents “all science.” The disciplines are little black dots on this paper. The massive amounts of white space between the dots represent antidisciplinary space. Many people would like to play in this white space, but there is very little funding for this, and it’s even harder to get a tenured positions without some sort of disciplinary anchor in one of the black dots. As we engage in tackling harder and harder problems that require many fields and perspectives, the separation of disciplines appears to be causing more and more damage. The complex system that is the human body has become impossibly multi-disciplinary. We should really be working on “One Science,” but instead we are a mosaic of different disciplines sometimes not even recognizing when we are looking at the same problem because our language is so different and microscopes are set so differently. The Center for Extreme Bionics at the Media Lab–led by Hugh Herr, Ed Boyden, Joe Jacobson, and Bob Langer–utilizes everything from mechanical engineering to synthetic biology to neuroscience in its quest to eliminate a variety of disabilities. 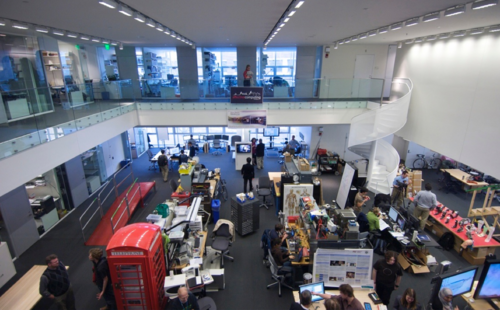 This disparate collection of disciplines would never fit in any traditional department or lab. Media Lab co-founder Nicholas Negroponte famously coined a twist on the academic dictum that faculty must “publish or perish.” Media Lab faculty, he said, must “demo or die.” I have made a modification- “Deploy or die.” I’d like all of the Lab’s faculty and students thinking about how their work ultimately deploys in the world, and if they can deploy it themselves, even better. I think this philosophy of working together on big projects will help bring researchers together across disciplines – creating a single science instead of fragmented disciplines. We will still need disciplines, but I think that it’s time we focus on a higher mission and the changes needed in academia and research funding to allow more people to work in the wide-open white space between disciplines – the antidisciplinary space. Update: One of our faculty members pointed out that disciplines are more like broad swaths and that a lot of the most cited papers are the ones in the disruptive “antidisciplinary” spaces.